3M Abrasive Systems offer expert knowledge and innovative products enabling you to complete processes quickly more cost effectively and safely. 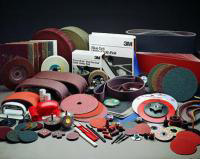 3M is a market leader in providing abrasive solutions for a range of applications, bringing over 100 years of abrasives experience to a number of industry sectors. 3M’s partnership with the automotive industry goes back to the early 1920’s when it introduced Wet or dry sandpaper to improve the sanding process. There is still the same commitment behind 3M Abrasives today, developing abrasives that cut faster, load less and last longer so that our automotive customers can make better vehicles at lower overall cost.